The preservation of the sacred fire of liberty and the destiny of the republican model of government are justly considered as deeply, perhaps as finally staked, on the experiment entrusted to the hands of the American People. I bought my annual National Park pass this year because I knew I’d be hitting a lot of the great places across the United States. It would’ve been nice had someone told me though that Mt. Rushmore wasn’t included in that deal. I was absolutely baffled when the booth attendant told me I still had to pay the $10 to park to see the monument. Fortunately I had the cash in my pocket and I was there just in time to see the lighting ceremony for the night. I’ve seen the monument a couple of times before, but never at night when it was all lit up, and I was quite excited for this opportunity. I was disappointed though to learn the fireworks I heard about didn’t accompany it except on special evenings. There ceremony before the lighting was nice enough. There was a short presentation by a ranger, a video and a flag-lowering ceremony where the military service personnel on hand were honored before Mt. Rushmore slowly came to light. It was a nice moment that I appreciated but also took advantage of to see the museum. The four American Presidents carved into the granite of Mount Rushmore were chosen by the sculptor (Gutzon Borglum) to commemorate the founding, growth, preservation, and development of the United States. They symbolize the principles of liberty and freedom on which the nation was founded. George Washington signifies the struggle for independence and the birth of the Republic; Thomas Jefferson the territorial expansion of the country; Abraham Lincoln the permenant union of the States, and equality for all citizens, and Theodore Roosevelt, the 20th century role of the United States in world affairs and the rights of the common man. 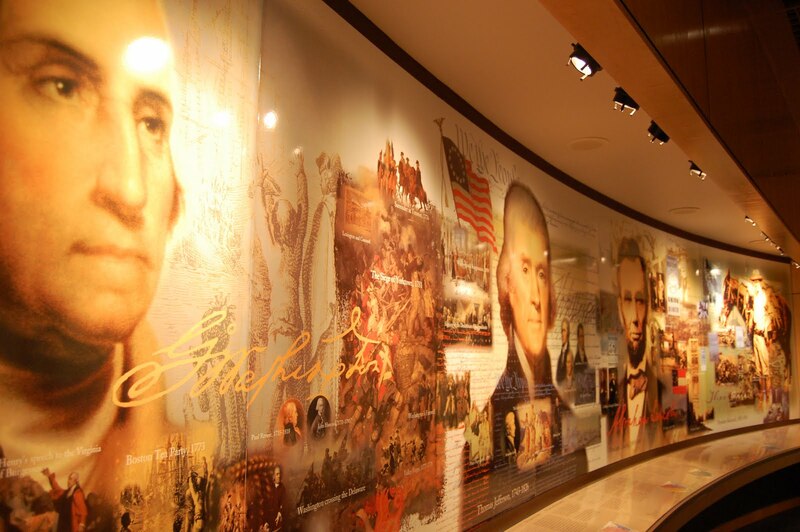 The museum is a must while visiting the monument. It’s a great place to learn about the monument’s construction as well as about the great history of the country. And I was certainly happy for a bit of reminding on things I had forgotten over the years. I reflected on these four men and what they meant as I walked out under the Avenue of Flags, which tells a little about each state and territory in the Union. I took one look back at the monument as I did to appreciate what these four men did to make our country great. I owe each of them quite a bit for the opportunities I enjoy today. And had it not been for each of them the world would be a drastically different place than what it is now.